Use the following list of Frequently Asked Questions to help aide you with using our site and services. If you feel that the following questions do not answer your request, then please feel free to contact us to discuss your specific questions. I’m new to envelopes. What do I need to know? It’s best to start with some envelope basics. How do I measure an envelope? How do I measure a window envelope? What’s your process for converting envelopes? Call us first to discuss all the details. For more info, see our envelope converting tips. Are your envelopes machine insertable? Although not all of our envelopes are machine insertable, we carry a wide variety of machine insertable commercials, catalogs, booklets, and announcements. See all of our machine insertable products. What is the minimum quantity for a special order? Special orders (anything that requires custom manufacturing) typically have a minimum quantity of 1,000 envelopes. However, if special paper is used, this is subject to change. Special paper often has a minimum quantity of it's own, which can raise the minimum quantity of an order drastically. Can I make my own layout for flat sheet printing? In order to ensure that your envelopes are printed and cut correctly, it's crucial that you contact us for a layout instead of creating or using your own. The type of machine and process in which your envelopes are die-cut can play a major role in the way your envelopes need to be layed out on the sheet. You can also read our converting tips to make sure you get the highest quality product possible. I’m new to labels. What do I need to know? Begin by checking out a convenient online version of our In-Depth Resource Guide. Will my labels be on rolls or sheets? Our standard method of printing produces labels on rolls. However, our labels can also come on sheets or can be fan-folded and packaged in cases, inner packs, clamshells, dispenser boxes, zip-lock bags, shrink wrapped, polybagged or banded. Please specify your exact needs when you place your order. 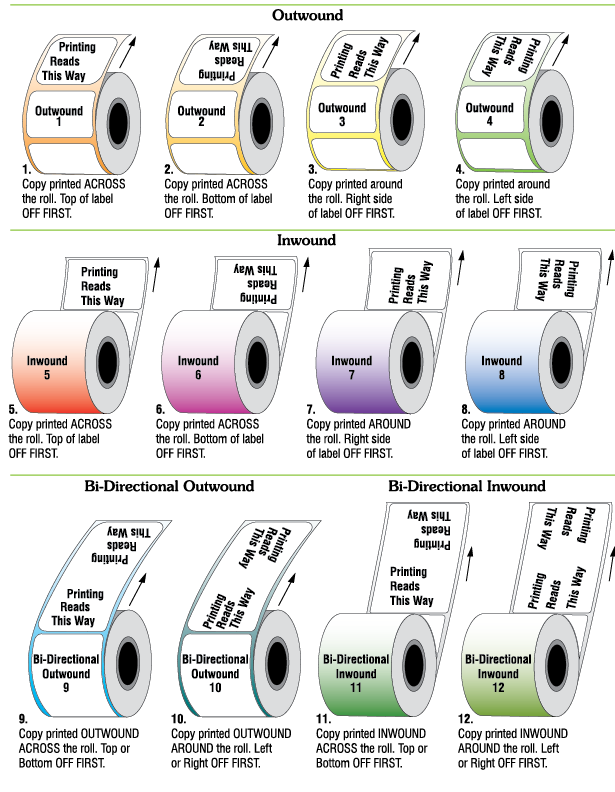 Can I specify which direction my labels are wound on the roll? Yes! This is called the label rewind - take a look at our rewind options. How do I know which face stock will work best? The label's intended use, the substrate the label is applied to, and the environment all play an important role in it’s performance. To get started, you can take a look at our most common label stocks, or browse through all our available face stocks. How do I know which type of adhesive to use? Many people feel that a pressure sensitive label can be applied successfully to everything. Not true! There are some surfaces to which pressure sensitive labels will not adhere at all. The key to success in any label application is to test the face material and adhesive prior to the label order being placed. This simple process will prevent problems from occurring later. Learn some adhesive basics. Western States sells wholesale to the printing, mailing, and office supply industries. Becoming a customer is easy—contact us to get started. What is a broken carton price? A broken carton price is when you order less than a full carton of a product (ex. 1 box). However, if ANY of the products on your order contain a full carton, you receive full carton pricing for all the products in the order. However, you cannot combine multiple broken cartons to get full carton pricing - you must have at least 1 full carton of a single product on your order to receive the discount. We have a variety of ways for you to send us your files. You can send your artwork via email to prepress@wsec.com. If you’re attaching your files, please be sure they are under 10mb. If your files are over 10mb, please use one of our other options. We accept credit cards (Visa, MasterCard, American Express), Cash on Delivery (COD), or Cash with Order (CWO) payments. You can also apply for open terms, allowing you to pay for your products within a specified time period after delivery. To apply for open terms, please contact our customer service department by calling us at 800-558-0514 or emailing us at customer.service@wsel.com. Yes! We have a convenient online ordering site for our customers to order any of our 1,500+ stock products. You can visit it here. Is Western States on social media? Who does Western States sell to? Western States is a wholesale manufacturer for the printing, mailing, and office supply industries. If you're outside of one of these industries, we may refer you to your local printer to order our envelopes. Where is Western States located? Western States has five locations throughout the United States, including our Corporate Headquarters in Butler Wisconsin, three envelope manufacturing plants, and our label facility. See our various plant locations. To better serve our customers, we also have more than 30 Sales Representatives out in the field.